I was deleting photos from my camera tonight and decided to share some with you from the past few weeks. 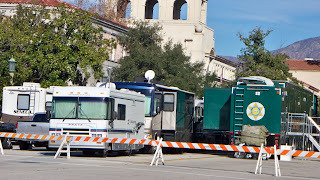 This is the final photo that filled up the memory card: It's of the Rose Parade public safety staging area in the Civic Center between City Hall and Police Headquarters. I shot it at about 9 a.m. today. Jessie Ramirez, right, who works in our Human Resources Department, was born and raised in Scotland. She was so happy to meet Bob Winter, Lord Provost of Glasgow, and his wife Sheena when they came to City Hall recently. It was my pleasure to give the Winters a private tour and tell them about the building's history and architecture. I attended an all-day conference a couple of weeks ago in downtown L.A. 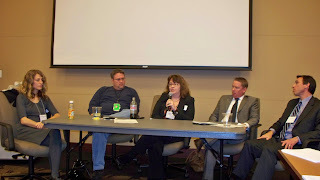 The theme was "The Brave New World of Media Relations" and featured journalists (left to right) Eileen Zimmerman, a freelance writer whose columns and other works appear in national newspapers and magazines; Steve Gregory, KFI Radio reporter and news anchor; Megan Garvey, county government and data projects editor at the Los Angeles Times; David Houston, editor of the Los Angeles legal newspaper Daily Journal; and Seth Lubove, reporter for Bloomberg Markets Magazine. They shared their experiences working in a rapidly changing industry as well as the impact of new technology on their own professional time. Mayor Bill Bogaard was among four men honored at the Pasadena/Altadena Links "Men of Distinction" awards gala at the Langham Huntington Hotel. After the presentations and truly inspiring words from the honorees, the Links women took to the dance floor. The Links Inc. is an African American women's philanthropic organization with chapters throughout the nation. The Pasadena, Glendale and Burbank PIOs get together three or four times a year to discuss shared issues and catch up with each other. At left is Ritch Wells, PIO for the City of Glendale, and Keith Sterling, PIO for the City of Burbank. 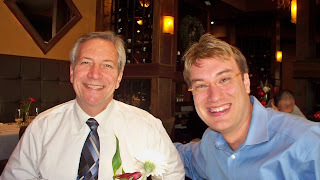 A couple of weeks ago I hosted the final "City Beat" program of 2009 on KPAS. Afterwards I snapped this of the crew striking the set. We'll resume production Jan. 8. I couldn't do my job without my PIO Team -- the employees who handle outreach in specific departments. I call them together quarterly to share information, bounce ideas off each other and provide whatever support anybody needs for a program or issue. Left to right: Catherine Hany, Pasadena Public Library; Erica Rolufs, Pasadena Water and Power; Janet Pope-Givens, Police Department; Joy Guihama, Public Health Department; and Linda Centell, assistant PIO for the City of Pasadena. Missing from the photo above are Mark Yamarone of the Transportation Department (he was at a conference) and Lisa Derderian of the Fire Department (she couldn't stay long). Which brings me to a brief trip down memory lane. 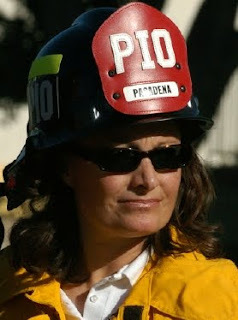 I used to be terribly jealous of Lisa's Fire PIO hat because there's never been an equivalent for a general city PIO -- for any city. So I came up with my own. * Now PIOs in cities throughout the realm envy me, as well they should! *With a little help from the mighty Zack Stromberg of the Public Affairs Office. Mike Salazar wins with his Wednesday 6:30 p.m. guess "This is the collapsed bleachers at Rose Parade. 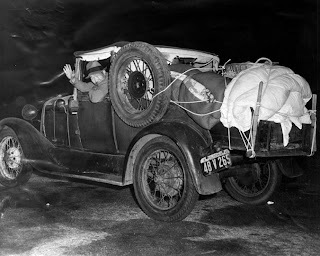 Forget the year - 1926 or so." 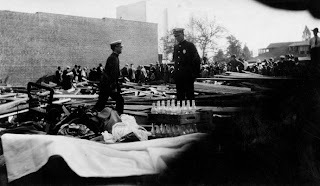 In the photo above, City of Pasadena public safety personnel look over the rubble left behind after a grandstand collapsed during the Rose Parade on Jan. 1, 1926. Eight spectators died. It was a terrible tragedy that, thanks to resulting regulations for careful construction and inspection of grandstands, has not happened again. It was also an early experience in hands-on disaster management for Pasadena public safety personnel. 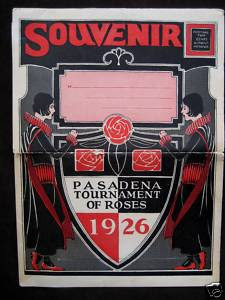 Pasadena, with its hundreds of thousands of guests for the thirty seventh annual Tournament of Roses pageant, was thrown from a scene of joyous enthusiasm into a turbulent tragedy when a grandstand seating 350 men, women and children collapsed as the floral parade was passing and 135 more women and children were injured and taken to hospitals while about 100 others were given first aid treatment. An investigation determined that the collapse was caused by many structural flaws, including poor-grade lumber, poor workmanship and no cross bracing. The contractor responsible for the grandstand was convicted of manslaughter but prosecutors dropped the charges when a new trial was ordered a year later. 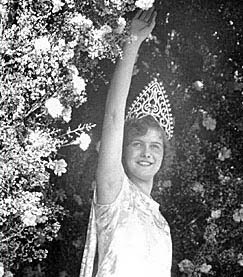 Fay Lanphier was the Rose Queen. She had been crowned Miss California in 1924 and Miss America in 1925. Col. L.J. 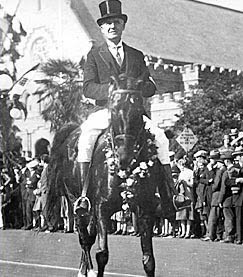 Mygatt was the grand marshal. 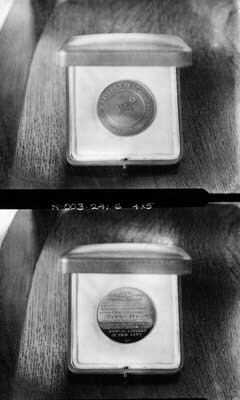 He had commanded the U. S. Army Air Corps Balloon School in France during World War I and then the Balloon School at Ross Field in Arcadia. 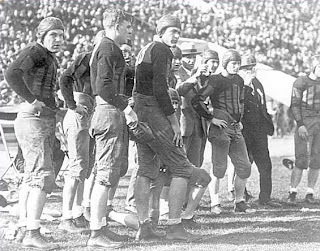 Later that day, the first local radio broadcast of the Rose Bowl Game featured sportswriter and former Olympian Charlie Paddock doing the color commentary. Alabama beat Washington by just one point -- 20 to 19. Now that's a game! Now it's one day shy of 84 years later. The 2010 New Year's Day events are tomorrow! And as it was in 1926, crews from the Street Maintenance and Integrated Waste Management Division of the Public Works Department will remove tons of litter and other materials and leave the 11 miles (5.5 miles, up one side of the street and down the other) of the parade route squeaky clean. They do magnificent work that continues all through the night! Thankfully they won't have to remove any collapsed grandstands. Many thanks to Los Angeles Public Library, Tournament of Roses Association and eBay for use of the photos. I'm not including a Mystery History photo this week because I'm on vacation beginning tomorrow. 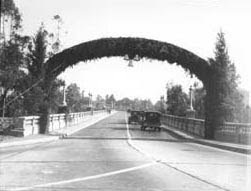 Instead, here's a historic photo of a "Merry Xmas" decorated arch over the Colorado Street Bridge. And, going back much further, here's a wonderful excerpt recounting the first Christmas in the Indiana Colony from the 1917 book "Pasadena: Historical and Personal" by J.W. Wood. There came the first Christmas when all made merry as best they could. There was no snow like "back home," of course, and it seemed unreal. It did not seem to the children that Santa Claus could ever come to them away off here; for how could he drive a sleigh where there was no snow? Yet they gathered in each other's homes and recounted memories of past Christmases and told yarns of the old times. Perhaps, this first Christmas, there were some tears shed; but, all in all, the first year of the Colony brought with it encouragement and some content; and certainly the hopes of the settlers were not diminished even if mingled with some alloy. 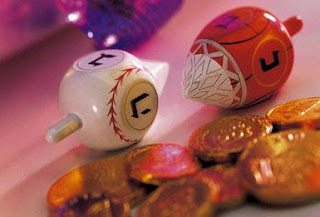 Have a wonderful holiday, everybody! I'll be back next week when Mystery History will continue. Barbara Ellis wins with her 8:49 a.m. Tuesday comment "My guess is that this is one of the more than 600 Japanese-Americans assembled at the Rose Bowl who left before dawn on March 23rd 1942 in a huge convoy heading for Manzanar, with almost 200 driving their own vehicles." Others were warm but Barbara hit it right on the head! In the photo above, an unidentified man waves farewell just before dawn on March 23, 1942, after being processed at the Rose Bowl Stadium for residency at the Manzanar internment camp. The stadium, Santa Anita Racetrack in Arcadia and the Fairplex in Pomona were among the processing centers and assembly areas for persons of Japanese descent living in western regions of Pacific coast states who would be relocated temporarily to camps in interior regions of California, Arizona, Utah and Wyoming. I didn't know until I heard Joel Sheldon speak at an event on Sunday that Vromans Bookstore regularly sent boxes of books to Manzanar during this period. Tomorrow morning approximately 1000 Japanese will leave for the evacuation city on a special train and in busses, while a huge motorcade, again under the convoy of the Army, will depart from the Rose Bowl in Pasadena for the same destination. 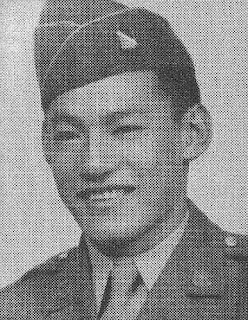 General instructions to Japanese leaving here for Manzanar tomorrow morning were issued yesterday by Maj. Gen. Walter Wilson, commanding the Southern California area. Each person, the orders declared, will be required to bring all bedding except mattresses, all tools of his trade, clothing, cooking utensils, a one-gallon container of drinking water and his personal belongings. Baggage will be limited to what each person can carry with him and to what can be carried by baggage facilities on train or bus. Before the war there were several businesses in Pasadena owned by Japanese American residents, most in the area bordered by Walnut Street, California Boulevard, Orange Grove Boulevard and Marengo Avenue. See a map showing businesses in 1940 here. Many Japanese American residents belonged to the Pasadena Union Presbyterian Church. There is an honor roll displayed on the front window in this photo that lists the 117 Japanese Americans from Pasadena who were serving in the U.S. military at the time. The church offered free storage for the belongings of Japanese Americans who were interned at camps during the war years, then served as a dormitory and job placement facility when they returned to Pasadena. It was one of hundreds of buildings demolished to make room for the 210 Freeway. 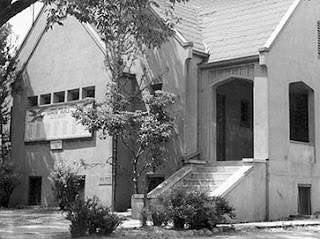 Although the structure is no more, the ministry lives on as part of the First Presbyterian Church in Altadena. Pasadena City College is looking for former Japanese American students who were forced to leave PCC because of World War II internment. Honorary degrees will be bestowed by PCC during commencement festivities in June as part of the California Nisei College Diploma Project. President Ronald Reagan signed into law the Civil Liberties Act of 1988, legislation on behalf of the U.S. government that apologized for the internment of Japanese Americans, called for public education about the camps and provided for restitution. More more than $1.5 billion in reparations were paid to individuals and heirs. The Japanese culture lives on in our community with organizations such as the Pasadena Japanese Cultural Institute and the Pasadena Buddhist Temple. The first person who comes closest will win a fabulous prize! Saturday, Dec. 12, at 11 a.m. -- Deanna Clark (left) and Deb Swartz of Old Town Cooking School will present a class on holiday entertaining at San Rafael Branch Library, featuring festive desserts and dishes. Enjoy sample treats and recipes to take home! Monday, Dec. 14, at 3:30 p.m. – Enjoy Chanukah fun and festivities with musician/singer Shulamit Rosner at Lamanda Park Branch Library. Tuesday, Dec. 15, starting at 8 a.m. – Ticketmaster will sell tickets to the Bowl Championship Series final game! This will be a sell-out so you'll have to act quickly. The final game will be played Thursday, Jan. 7, at 5 p.m. at the Rose Bowl Stadium between #2 BCS-ranked Texas Longhorns and #1 BCS-ranked Alabama Crimson Tide. Tuesday, Dec. 15, starting at 8 a.m. -- You can also purchase tickets from Ticketmaster for the giant BCS Tailgate Party featuring the Goo Goo Dolls and Switchfoot, interactive games and attractions, children's activities and much more. Tuesday, Dec. 15, at 6 p.m. – If you work for a local non-profit organization and are interested in applying for Community Development Block Grant (CDBG) and other funding, learn more about the RFP process and evaluation criteria during a meeting at Jackie Robinson Center, 1020 N. Fair Oaks Ave. (626) 744-8318. Tuesday, Dec. 15, at 7 p.m. -- Flights of Fantasy Story Theatre presents Family Night at Santa Catalina Branch Library with a holiday variety show guaranteed to delight event the crankiest Scrooge! 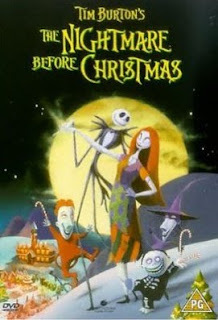 Wednesday, Dec. 16, at 1 p.m. -- This week's film in the Donald R. Wright Auditorium at Pasadena Central Library is "The Nightmare Before Christmas" (1993) with the voices of Chris Sarandon, Catherine Harris and Paul Reubens in the animated tale of Jack Skellington, the king of Halloweentown, who discovers Christmas Town but doesn't quite understand the concept. 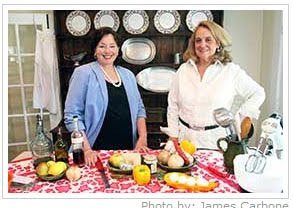 Old Town Cooking School photo courtesy of Pasadena Weekly. UPDATE -- He lives! Chris contacted me today (Friday) with his email address and blog address, so he indeed wins a fabulous prize. Thanks for proving me wrong, Chris! Chris had the right answer, but the new rule is that if there's no way for me to contact the winner, there is no winner. The conspiracy theorist in me thinks "Chris" is a mole with an inside track. Please prove me wrong, Chris! 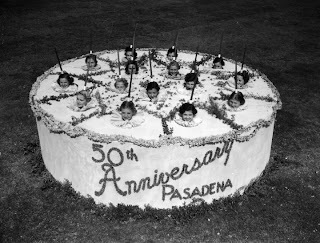 Pasadena Junior College co-eds are shown forming living candles in this huge anniversary cake commemorating the fiftieth anniversary of the incorporation of Pasadena to be celebrated June 19. The girls are Evelyn Hansen, Ruth Nickerson, Barbara Lombard, Betty Wilcox, Peggy Munn, Ellen Jones, Marjorie Loomis, Helen Sperry, Mariam Purdon, Virginia Larsen, Joy De Long, Beverly Millar, Carol Crum, Patty McCune and Josephine Tryon. 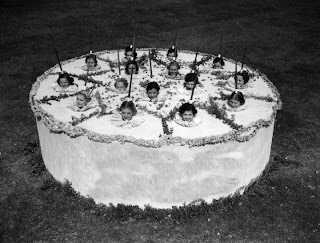 The cake is twelve feet in diameter. On June 18 at the Rose Bowl Stadium about 50,000 spectators witnessed the major feature of the City of Pasadena's 50th anniversary observance: A combined commencement pageant for 2,487 new graduates of Pasadena Junior College, local high schools and junior high schools with the theme "The New Atlantis." 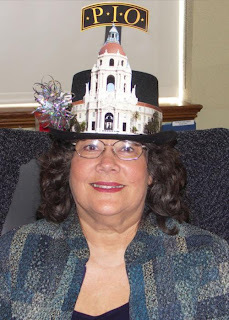 At this same event 100 city, county and school officials, accompanied by surviving pioneers, marched into the stadium and formed a human city seal featuring a rose crown. I've never found a photo of this but would love to come across it someday! It was on June 14, 1886, that the few thousand ranchers living in this area were notified that they no longer were "hicks," but resided in an incorporated city, or glorified dude ranch. Here's something more dignified, written by J.W. Wood in his book "Pasadena: Historical and Personal" (one of my favorites in the Centennial Room at Pasadena Central Library). Men and women may live for a long time in amicable social partnership and not feel the need of laws or miss the absence of edicts. But a time comes when a civic ambition stirs them, and necessity forces them to organize into a formal and legal partnership. It was thus with Pasadena. Although there were some who declared against any necessity of it, events arose that compelled it. Pasadena was within the township of San Gabriel and the jurisdiction of its police court. 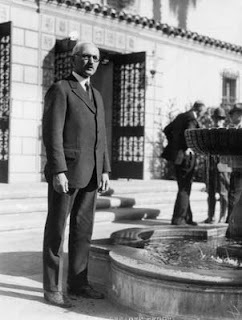 I believe Otheman Stevens, known as the popular and able dramatic critic and special writer on a Los Angeles newspaper, for a time, administered Justice in the little court of San Gabriel. Little was there for him to do in a Judicial capacity which gave him the more time to practice with his pen. He also was "regular correspondent" for the Pasadena Union and was thus exalted in the ranks of literary endeavor! But, as I said, San Gabriel administered our court of Justice. Pasadena wanted its own. Pasadena had no official existence yet, and no officials, excepting its School Trustees and a Deputy Constable. 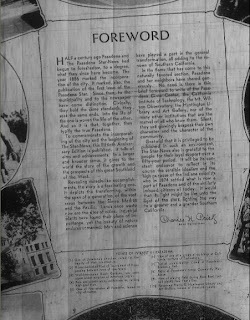 Coincidentally, the Pasadena Star-News celebrated its 50th anniversary in 1936. Here's what I love most about our Christmas tree-lighting event every year at Pasadena City Hall: Ours is not an uber fancy-schmancy department store type of tree. Instead, ours is traditional and folksy. The entire ceremony warms everyone's hearts. Last night dozens of people gathered in the grand entrance for the occasion. Expectant faces were everywhere we looked. Robin Turrentine led the McKinley After-school Performing Choir. These children -- and their director -- are magnificent. Mayor Bill Bogaard and I shared the MC responsibilities. Some of our wonderful volunteers served up refreshments. And then Mayor Bogaard flicked the switch that lit the tree. All photos were shot by the mighty Zack Stromberg of my Public Affairs Office staff. Who are these young women? And what's happening? In the interest of full disclosure, I erased something that will be back in full view for the big reveal on Thursday. Comments are accepted from anyone with a valid URL or who send me an email identifying themselves. 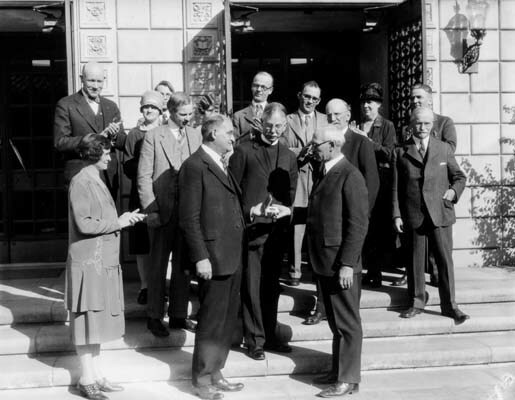 Elijah wins with his 7 a.m. Tuesday guess "Is Myron Hunt posing by the fountain in the Central Library courtyard at the library's dedication in 1927?" In the photo above, architect Myron Hunt stands next to the courtyard fountain during dedication ceremonies for the new Pasadena Public Library on Feb. 12, 1927. During the festivities Hunt gave the $586,000 building's keys to City Librarian Jeanette Drake (left in photo below) and received the Arthur Noble Civic Award from Franklin B. Cole, chairman of the Pasadena Board of City Directors (center). 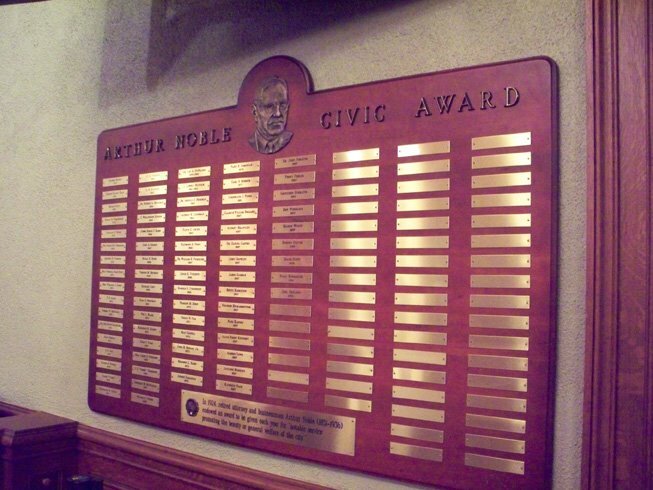 Here's the award he received. 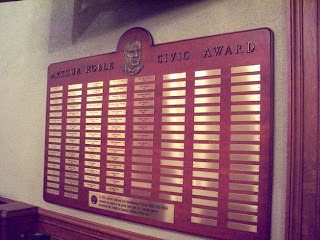 All of the Arthur Noble Civic Award recipients are listed on a wall plaque in the council chamber at Pasadena City Hall. Learn more about the library's architecture here. Myron Hunt designed many iconic buildings and other structures, including this little gem. To answer Barbara Ellis's question, when the fountain was renovated in 2002, it was dedicated to long-time Pasadena Public Library Foundation volunteers Ann Jarvis Longyear and her husband Douglas McKay Longyear. The $15,000 cost of the renovation was donated by individuals specifically to honor the Longyears for their dedication. The renovation carefully preserved the flavor of the fountain, designed in 1927 to replicate one at the Alhambra in Granada, Spain.